A kitten with sore eyes is a pitiful sight and, as a caring pet owner, you'll want to do all you can to comfort and cure the little one. Sore eyes in kittens can arise from various causes, so the correct treatment is vital. Because untreated eye conditions can cause severe and permanent damage, seek a diagnosis and start appropriate therapy without delay. Make an appointment with your veterinarian to establish a diagnosis. Sore eyes in kittens are most commonly due to conjunctivitis, inflammation of the mucous membrane surrounding the eyeball. Conjunctivitis typically arises from treatable infections, including the feline herpes virus and Chlamydophila felis, a bacterial infection. Because eye and respiratory problems often occur together in kittens, expect your veterinarian to carry out a thorough examination. Infected eyes usually respond well to topical treatment in the form of eye drops or ointment containing antibiotic and anti-inflammatory medication. Depending on the nature and severity of the condition, your veterinarian may also prescribe oral medication or an injection. Gently cleanse the eyes with cotton swabs soaked in a mild saline solution to remove debris and help ease discomfort. You can safely carry out this treatment as soon as symptoms become apparent. As you commence the veterinarian's prescribed treatment, you may need to clean the kitten's eyes before applying drops or ointment to enable the medication to take full effect. If the saline solution is distressing, use cooled boiled water instead. Ask your veterinarian to demonstrate the correct way to administer the medication. 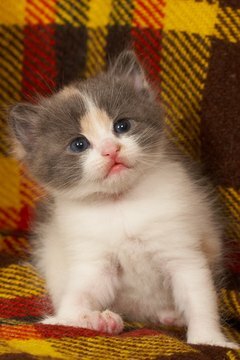 Kittens may become distressed when given medication, whether topical or oral. Use calming tones and offer treats for encouragement. If necessary, enlist the help of another person to hold and soothe the kitten while you administer the treatment. Place the kitten on your lap, facing away from you and apply drops or ointment from the outer corner of the eye. To avoid injuring the delicate eye tissue, position the tube as parallel to the eye as possible during application. Ensure that medication is given regularly as prescribed and complete the entire course of medication even if your kitten's eyes appear clear before that time. A kitten with eye discomfort may lack the enthusiasm to eat, particularly if respiratory problems are also present, but needs adequate nutrition to fight off the infection. If necessary, hand-feed your kitten with tempting soft food; bottle-feed younger kittens with kitten milk replacement liquid. Maintain hydration by providing cooled boiled water, using a dropper, syringe or pet nursing bottle, according to the kitten's strength. If he continues to refuse food or loses weight, your veterinarian may prescribe an appropriate high-energy formula food. Provide your kitten with a warm and comfortable bed, away from drafts. Allow plenty of quiet time and don't permit anything to stress your kitten and hamper his recovery. Don't isolate him from human contact; continue to offer affection but avoid vigorous play or other activities until he's well again. With timely and appropriate treatment, most cases of sore eyes clear within a week or two. More serious infections require longer courses of medication. Talk to your veterinarian about vaccinations, as these may help your kitten to fight off some infections in the future. If you plan to allow your kitten outdoors once he's recovered, cat-proofing your yard can help to keep him safe and prevent contact with infected felines.